And just like that, we're in a new year, happy 2018 to all my readers! Just wanted to say a massive thank you for continuing to read Tee-clutter and I hope it continues to inspire you. January is usually the time where people spend less money, although shops try to tempt us with their sales, I 'try' to avoid it altogether! However, a bargain that will last in your wardrobe is always a good idea, for example, those perfect fit jeans or cashmere sweater or even those trainers that will take you into Spring/Summer. Whatever it is that catches your eye when shopping, try and think if you actually need it and if you will be wearing it a lot. I recently bought a classic Trench coat in the sale but realised it was an impulse buy, although a staple item I don't think I would wear that particular style much. Over the years I've invested in items that I can wear often. 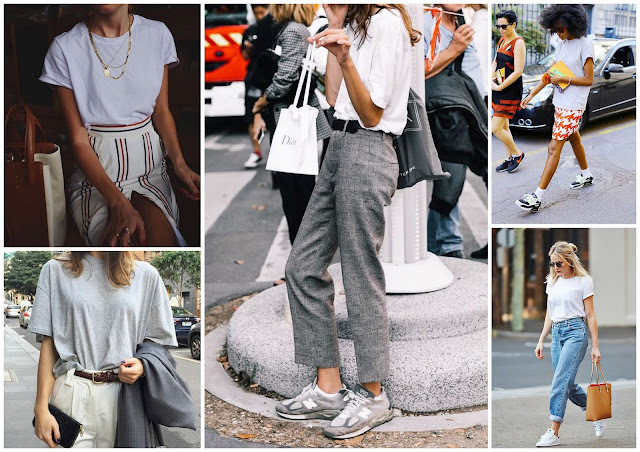 To help you shop your wardrobe, I have put some street style inspiration together from my wardrobe favourites. First up, the good old basic tee! You can't go wrong with a basic tee, I usually shop in stores like Cos, Zara or H&M but I recently came across a small business called Ivy (www.ivyt.co.uk), which sells all your wardrobe staple tops you need. I was gifted the grey marl 'Maggie' tee and absolutely love the shape and colour. The striped top again goes well with everything, try mixing it with prints or just wear tucked into jeans and it will always look effortlessly stylish. The classic shirts (denim/white/striped) are those items that you could wear in many ways, all wardrobe staples, make the most of them by layering them this winter. Skirts and dresses in winter can be worn with tights or socks or layered over trousers/jeans. Make more wear out of your 'nice' dresses and skirt. 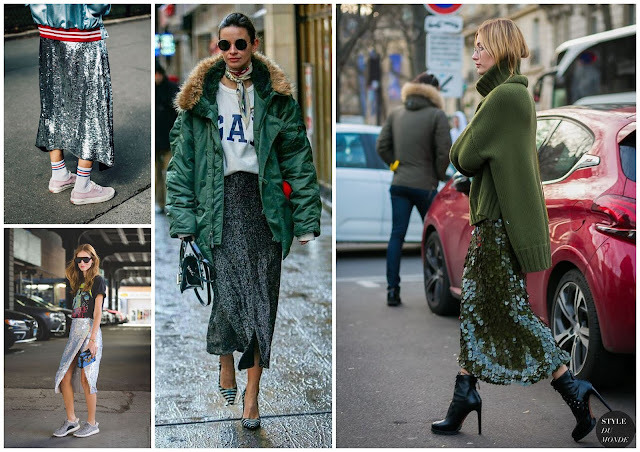 If you want to make more wear out of your sequin skirts from the festive season wear them with chunky knits and trainers. Layer it up with a bomber or leather jacket to toughen up the look. 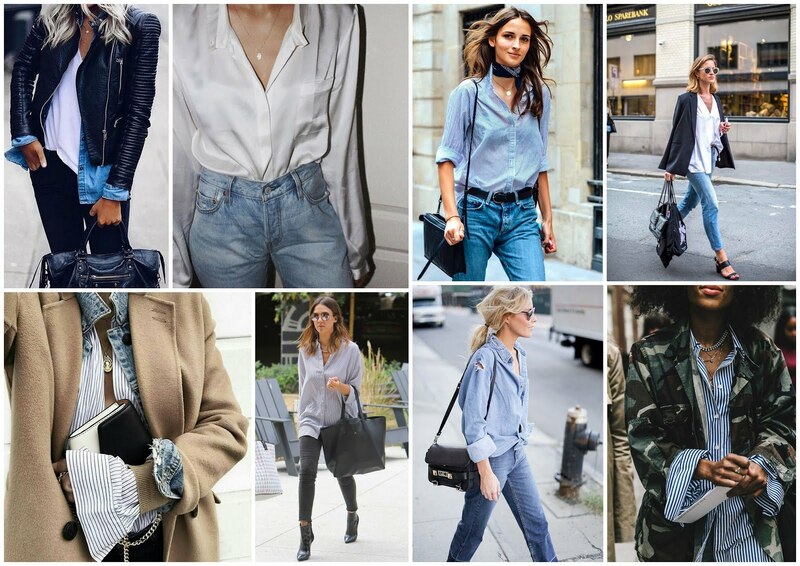 I hope all this inspiration has helped you with any wardrobe crisis this month, make the most out of your wardrobe. All images are taken from Pinterest, you can follow me on Pinterest too.